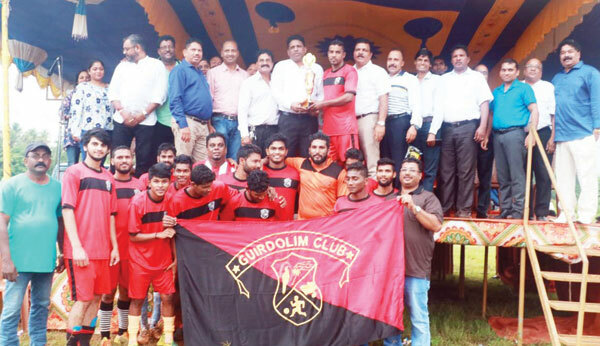 VERNA: Guirdolim Club registered a narrow 1-0 win over Curtorim Gymkhana to lift the 14th Verna Panchayat Cup, organised by Verna Sports Club and played at Verna Panchayat ground on Sunday. Irfan Yadwad scored the match winner for Guirdolim in the 35th minute with a placement shot. Curtorim tried their level best to find the equaliser but their strikers lacked sharpness, and Guirdolim defenders guarded the fort and avoided the Curtorim strikers to score till the end of the match. Guirdolim Club is coached by Glimson Fernandes. The winners received Rs 30,000 while the runners-up had to be content with Rs 25,000. Cuncolim MLA Clafasio Dias was the chief guest and gave away the prizes to the winners and runners-up in the presence of Nuvem MLA Wilfred D’Sa, Sanjeet Rodrigues Managing Director of Solid Waste Management Corporation and other dignitaries and club officials.